Toss 6 duck breasts, ½ cup strawberry juice, 1T honey, 1T crushed garlic, 1 thyme sprig, black pepper and salt together and marinade for 4 hours. Sear duck breasts until cooked, remove and keep warm. Add 2 cups strawberries and sauté in the drippings. 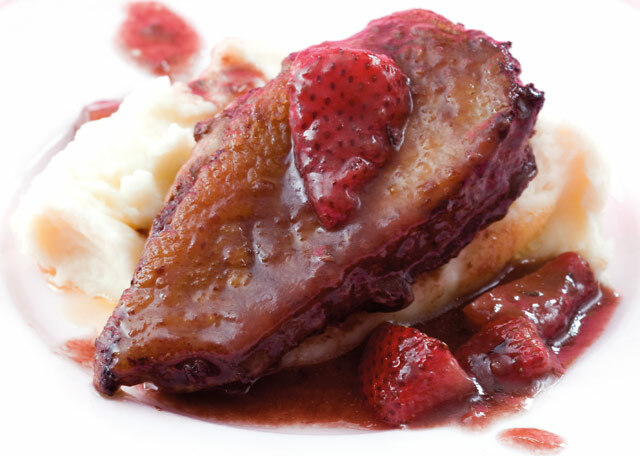 Cook strawberries until caramelised then add marinade and reduce until thick and syrupy. Serve with the duck breasts and mashed potatoes. This quick and easy recipe makes the perfect party treat for warm summer's day!